What’s At The Bottom Of The Chicago River? A collection of things that are supposed to be under the water and not in the water at all. Mike lives in Chicago’s Fulton River District, so he crosses the river frequently in his day-to-day life. Once while walking over the Kinzie Bridge, he looked down to see a barge full of garbage passing below. We found that Mike’s question can be answered in a thousand ways, and I decided to go with the generalist approach, starting with the very bottom. 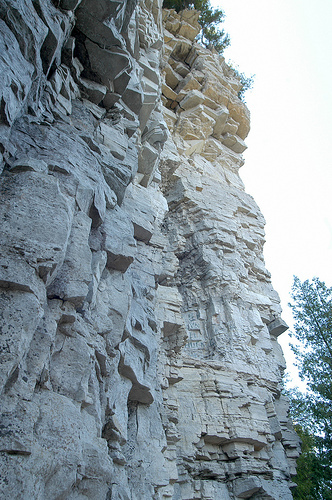 Now to get all literal, at the very bottom of the river is rock — Niagara limestone, to be exact. According to David M. Solzman&apos;s book The Chicago River, the ancient bedrock of the river was formed a few hundred million years ago when what’s now Chicago was covered by a salty sea. Despite the fact that much of the Chicago River system is man-made, both the natural bottom and the man-made, dynamite-carved bottom are formed out of this rocky substrate. Sitting atop that limestone bottom are layers and layers of fine sediment that, in some spots, pile up to a few feet deep. This muck is mainly the result of clay, dirt, topsoil and other small particles being picked up by rain that flows atop and through the ground and ends up in the river. Of course, the river holds many more goodies than rock. We&apos;ll get to those later. 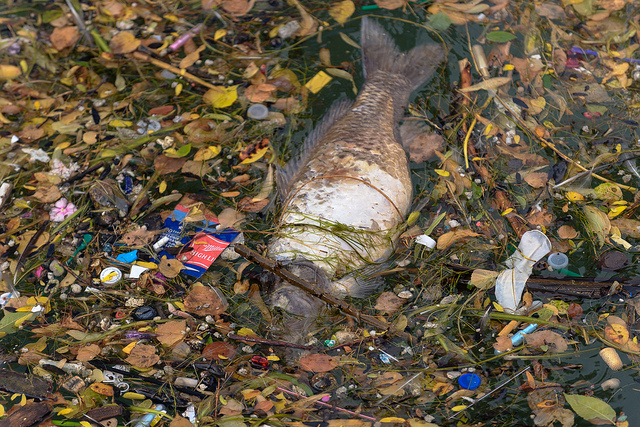 With the river’s reputation of being a filthy, disease-ridden waterway, it’s easy to forget that it’s also an ecosystem, a home to a lot of other living, breathing organisms. And, beyond that, it’s useful to consider it as a kind of living, breathing organism in its own right. This past summer, Curious City intern Logan Jaffe and I tagged along with a bunch of teenagers from the UIC Health Science Enrichment Program on their field trip to see what things live in the water. Mark Hauser, Education Manager with Friends of the Chicago River, led the expedition. As we made our way to the shallow, rocky river section of the North Branch near Irene Hernandez Picnic Area, many of the students expressed amazement upon seeing the river nestled into a peaceful forest. Within minutes of the school group gathering near the water, a deer nonchalantly traipsed through the shallow stream, pausing to sip. For a moment, you could feel removed from the city — except, that is, for the graffiti-covered abandoned rail bridge that spans the water. Hauser says in the early 1970s (when the waterway was arguably at its most polluted), the river played home to just a handful of fish species; since then, however, a number of initiatives such as the Tunnel and Reservoir Plan (aka “the deep tunnel”) and the Clean Water Act have improved the waterway’s health to the point where it now supports approximately 75 species. But because the river is largely an artificial system, it’s missing some natural features that make for good wildlife habitat: bends, riffle zones (stretches of choppy water where water becomes oxygenated) and gently sloping banks that allow plants to grow and fish to spawn. Instead, there are long stretches of straight, featureless “U”-shaped canals with reinforced walls. These engineered expanses of concrete limit what kinds of life can flourish. Of course one of the biggest ongoing challenges to improving the health and biodiversity of the river is the continued effects of the stuff we deposited in there a long time ago, not to mention the stuff we continue to place in there today. Recently I kayaked from the North Avenue bridge to the Ogden Slip with an underwater camera in tow to glimpse what’s at the bottom. During the trek, I passed by so-called “floatables”: flip flops, a can of kidney beans, condom wrappers and assorted plastic bottles. And while the first mile or so of was an affront to my sense of smell (let’s just say it was pretty dank out there), my artificially augmented sense of sight didn’t fare much better, as my camera also couldn’t make out anything beyond a few inches of its lens. The murky, brown river got a touch clearer when I hit Wolf Point, where water from Lake Michigan flows through the main stem. But even there, the river’s turbidity rendered my underwater camera pretty much useless. 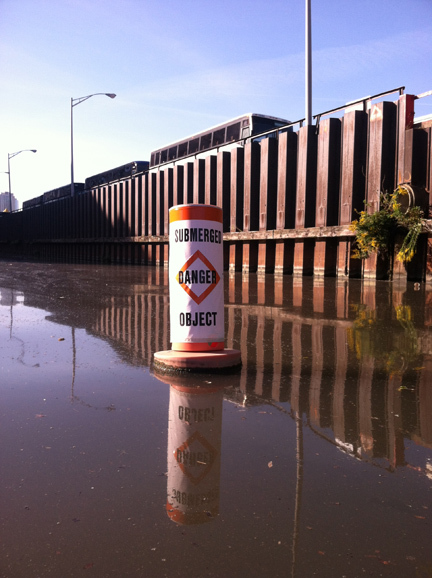 Curious City: What&apos;s at the bottom of the Chicago River? from WBEZ on Vimeo. So to get a visual account of what is in there, I turned to ask Scudder Mackey, an expert consultant in coastal management who has a different set of tools, ones that could penetrate what my camera couldn’t. A few years ago, he said, he spent a Thanksgiving weekend mapping the Chicago River bed. Among some of the most interesting takeaways: The river is home to discarded shopping carts, sunken barges, small boats and cars. Lots of cars. He said there are even parts of the river (at the Illinois Route 83 bridge over the Ship and Sanitary Canal) where there’s more than a dozen cars, some piled atop one another. He thinks they might be popular spots for people to collect on insurance. But how does he know about the junk and all the cars (and the stacks of them)? He doesn’t use a camera or light to detect them; instead, he uses a Side Scan Sonar, a device that bounces sound energy off the bottom of the river and measures how long it takes for the signals to return. The differences in the length of the waves’ return trips produce images. Much niftier than my camera on a stick and … he doesn’t have to get wet in the process. Mackey says the artificial parts of the Chicago River system, which comprise most of it, were built at the turn of the 20th century, with economic development in mind. Until the last couple of decades it primarily functioned as a cheap, but slow, watery highway for barges, as well a means to manage wastewater and stormwater. “People say ‘Oh, God. We’ve destroyed a natural system!’ But we haven’t,” Mackey explained. “It was never a natural river — it was really a swamp.” That is, it was a swamp until people came along, dug it out and made it flow the way it does today. Adding to the “unnatural” elements of the river are chemicals, pathogens, pharmaceuticals, and bacteria from untreated sewage that flows in after heavy rains. Thomas Granato with the Metropolitan Water Reclamation District of Greater Chicago says the levels of pathogens that can cause diseases (e.g., Salmonella, Cryptosporidium, Giardia) are very low, as are the levels of known harmful chemicals. While the river has come a long way since the 1970s, Granato admits it still has a long way to go. He says in terms of chemicals: “Probably the biggest concern is the legacy chemicals that are contained within the older sediments on the bottom of the waterways. There are still sediments we know from our samplings that contain PCBs, polyaromatic hydrocarbons. They’re products from combustion in autos and auto plants. These chemical stores in river sediment are easy to find around the notorious “bubbly creek” on the south fork of the South Branch, a stretch that’s near where industry — including the stockyards — was situated. Incidentally, Mackey says his Side Scan Sonar picks up images of depressions in the river bed from where organic matter such as cow carcasses have piled up and bubbles of methane gas continue to rise to the surface. If there is a lesson to be drawn from this investigation into what’s at the very bottom of the Chicago River, Granato sums it up well. “I guess we just don’t realize there’s a cost for our modern lifestyles — our modern, convenient, comfortable lifestyles,” he said. “There’s no way to completely erase the evidence of our existence and we’re never going to have water that’s perfectly pristine or pure, because when you concentrate this many people in such a small area it’s not possible to return to that condition.” Shampoos, soaps, fragrances, cosmetics, and even the medications we consume and excrete (not all of it stays in you, if you catch our drift) all end up in the river on some level. If this reality check bums you out, here’s one thing you can do about it. On Saturday, Sept. 29, the MWRD will be participating in a national day of action to collect unwanted pharmaceuticals to reduce accidental contamination of waterways. It’s in partnership with the U.S. Drug Enforcement Administration as part of National Take Back Day. There are dozens more medication collection sites around Chicago and its suburbs, too. Click here to find a collection location closest to you.